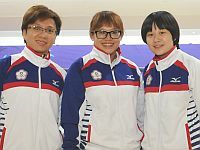 Korea’s Lee Na Young, Son Yun Hee and Jung Da Wun (pictured left, l-r) have their sights set on the gold medal in Women’s Trios at the 17th Asian Games in Incheon, Korea, as they averaged 226.11 in the first block of three games on the short oil pattern to lead the field of 22 trios from 13 countries Saturday evening at Anyang Hogye Gymnasium, Incheon, Korea. The multiple World and Asian champions finished with 2035 including games of 694, 657 and 684. Na Young, who had games of 268, 224 and 226, led the trio with 718, a 239.33 average, while Yun Hee and Da Wun contributed 666 and 651, respectively. The Koreans out averaged their nearest competitors from Chinese Taipei by more than 16 pins. Pan Yu Fen, Tsai Hsin Yi, and Chang Yu Hsuan (right, l-r) were 145 pins behind the Koreans in second place with 1890, a 210 average, including games of 631, 653 and 606. Third place belonged to Haruka Matsuda, Kanako Ishimine and Natsuki Teshima (left, l-r) of Japan, who were further 18 pins behind in third place with 1872. The Japanese women had games of 609, 598 and 665. With five teams 80 pins or less away from the top three – Singapore (4th; 1864), Indonesia (5th; 1861), Singapore (6th; 1856), Malaysia (7th; 1797) and China (8th; 1792) – Sunday’s second block on long oil promises to be an extra exciting round. (pictured right, l-r: fourth-place Singapore with Joey Yeo, Daphne Tan and Shayna Ng. Boosted by her 718 series today, the highest three-game series in the women’s division so far, Lee Na Young overtook teammate Son Yun Hee to take the lead in All-Events (combined scores in Singles, Doubles, Trios and Teams) after 15 of 24 games with 3233 and an average of 215.53. Yun Hee, the reigning World Champion in Masters, is 20 pins behind in second place with 3213. Malaysia’s Sin Li Jane remained in third place with 3169. The women’s trios will return on Sunday morning at 9 a.m. to determine the medalists in the second block of three games on the long pattern. The men’s trios will complete their second block starting at 1.30 and 6 p.m. The victory ceremonies are scheduled for 9.15 (women) and 9.30 p.m. (men). The Asian Games, a.k.a. Asiad, is a Pancontinental multi-sport event held every four years among athletes from all over Asia. The XVII Asian Games run from September 19th to October 4th in Incheon, South Korea, featuring more than 9000 athletes from 25 countries, who will compete for medals in 36 sports. Bowling made its debut in 1978 (Bangkok, Thailand) and returned in 1986 (Seoul, Korea) and was part of the Games in each event since 1994 (Hiroshima, Japan). The Bowling competition of the Incheon Asian Games will be contested Sept. 23 – Oct. 2 at Anyang Hogye Gymnasium bowling center. 176 players, 102 men and 74 women, from 19 countries – China, Chinese Taipei, Hong Kong, China, Indonesia, Japan, Kuwait, Macau, China, Malaysia, Mongolia, Philippines, Qatar, Saudi Arabia, Singapore, Thailand, United Arab Emirates, Uzbekistan, Vietnam, Yemen and the host country Korea – bowl for gold, silver and bronze medals in Singles, Doubles, Trios, five-player Teams, All-Events and Masters. The competition will be contested on a 36-feet short and a 46-feet long lane conditioning pattern. See also the Kegel Lane Map Report. The winners in Singles (long oil), Doubles (short oil), Trios (short/long) and Teams (long/short) will be determined by the highest six-game total. The player with the highest 24 game total of the four disciplines will become the All-Events champion. The top 16 women and top 16 men in All-Events, but maximum two per national Olympic Committee, advance to the Masters finals Oct. 1 & 2. Those 16 bowl two eight-game blocks of Round Robin match play – first block on short, second block on long oil – to determine the top 3 players for the stepladder finals, which will conclude the Asian Games bowling competition. Standings after three games on short oil. Top 16 (max two per NOC) after 24 games advance to the Masters finals.